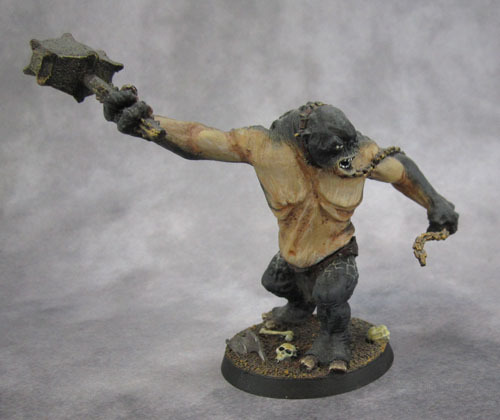 Citadel Moria Cave Troll with Chain and Hammer | Azazel's Bitz Box. 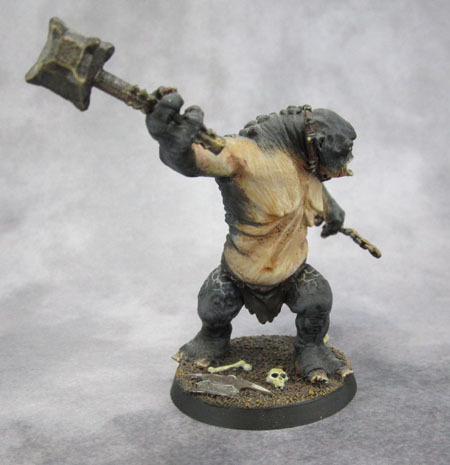 The last (currently) painted “proper” model from the Moria army – aside from extra models that will be roped in like my GW Orc & Goblin War Machines, and other monsters from Reaper Bones and such. 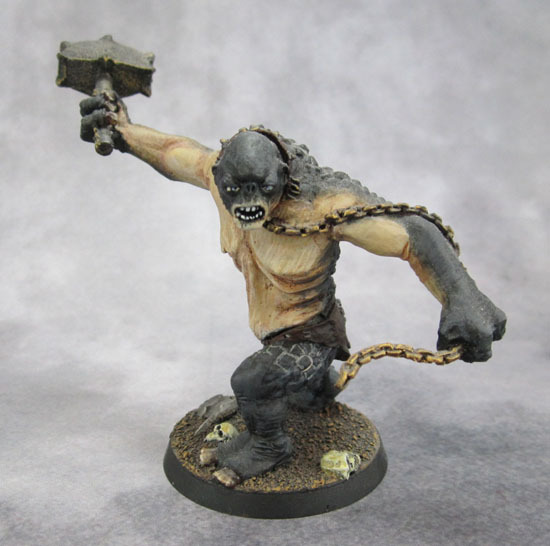 The first Moria Troll from GW’s Lord of the Rings Fellowship of the Ring range. I painted this guy using GW’s studio model a general guide, and somewhat followed their scheme and style of blending between the flesh tones and the blackened skin, as well as the flesh between the cracks. Since I followed their scheme it’s most likely a fair bit brighter than the actual movie CGI model, but hey. I added a couple of resin “orc” skulls and a femur from some blister I bought in the mid-90’s, along with a Moria Goblin Shield. I’ll need to push-mould some replacements! 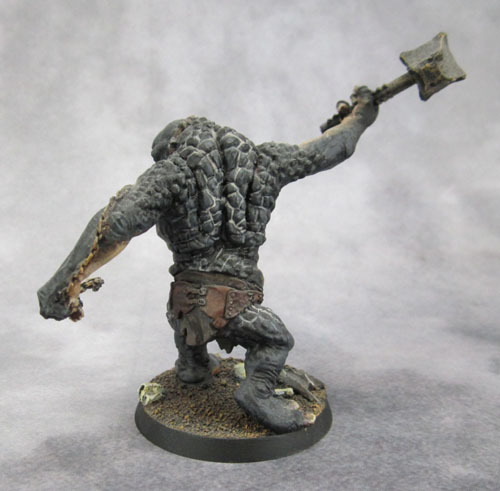 Aside from obvious uses in LotR games, he’s going to act as a Troll Bruiser (hero) to start with in Kings of War. Later on when I’ve got the other Moria Cave trolls painted, he’ll simply become one of a unit, and eventually Buhrdur, the Hill Troll Chieftain will take over the Bruiser role in the army. A view of the backside. The model was painted as a Christmas gift for Marouda back in sometime ..around 2003-5. He’s pretty much lived on shelves ever since. I’ll get some WIP Moria army shots up soon. Hopefully this weekend. This entry was posted in Lord of the Rings, Moria Goblins and tagged Lord of the Rings, LotR SBG, Moria Cave Troll with chain and hammer, Strategy Battle Game, War of the Ring. Bookmark the permalink. Ace looking troll! 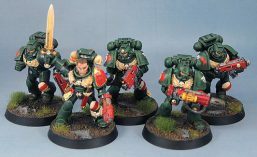 I am constantly astounded by the sheer quantity of superbly painted miniatures you seem to be able to finish off as I am lucky to paint three a week! Thanks mate. Some of the paint on these is quite old, but I usually try to finish something off each weekend at the moment. The blogging and feedback like yours helps keep me motivated. Great work, really nice painting.